After a Wii U launch that was full of ports of big games from big game companies, it appears that the winter and spring will see the Wii U missing out on most of the major games coming to its rival consoles. Coming to Wii U? "Yes, ACM is coming to Wii U," a rep from Sega confirmed. We have not announced a specific date yet, just that it launches before the end of Nintendo's launch window (aka March 31, 2013)." Coming to Wii U? "No plans," according to a rep for EA. Coming to Wii U? The game's creative director just told Destructoid that "nothing is brewing right now," so highly unlikely. Coming to Wii U? "No plans," according to a rep for Deep Silver. Coming to Wii U? All we could get was a rep for Capcom reiterating that the game is "confirmed" for the above platforms. Coming to Wii U? Nothing announced. Seems unlikely, but here's a glimmer of hope, if you're the unusually optimistic sort. Coming to Wii U? Yes! Kotaku: Do you have plans to bring Revengeance to Wii U? Korekado: We really developed the game based on these two consoles [PS3, 360] and the Wii U, we think, is unique in a way that the controller is innovative and the entire console's pretty much not hand-in-hand with the consoles that we're making it for now. So if we were going to make it for the Wii U we'd have to start from zero again and really design something for that console, so we could say 100% that it was a good game for this console. Kotaku: Could Wii U run the Revengeance engine? Korekado: I haven't really tried it, so I'm not quite sure. Coming to Wii U? Not bloody likely. Coming to Wii U? In August, Capcom's U.S. senior VP Christian Svensson said the idea of bringing it to the Wii U was "explored" but didn't synch up well with the developers' schedules. Coming to Wii U? "THQ hasn't announced plans for a Wii U version of the game and is focusing attention on the current versions," a THQ rep told us. Coming to Wii U? "The decision to bring a game to the Wii U will be made on a case-by-case basis," a Ubisoft rep told us. "We don't have any details to share at the moment." Coming to Wii U? A Square Enix rep says: "the announced platforms for Tomb Raider = X360, PS3, PC. No Wii U." 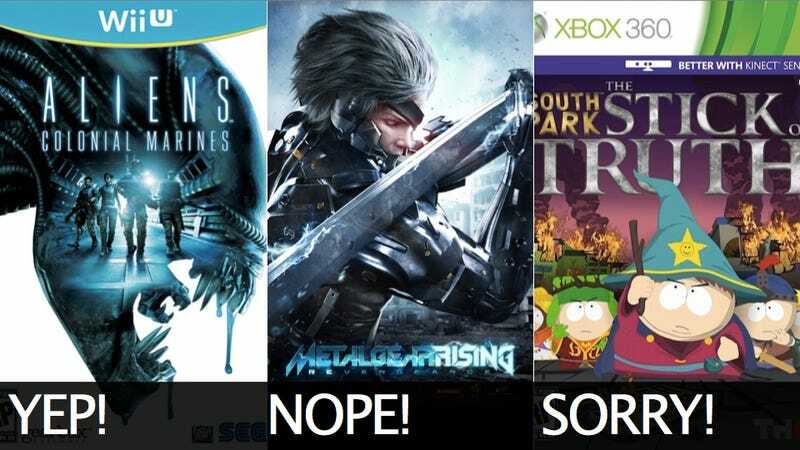 As you can see, the winter and spring will be pretty good seasons for big-budget games on Xbox 360, PS3 and PC. But on Wii U? Pickings will be slimmer. The Wii U launched with Mass Effect 3, Call of Duty: Black Ops II, Madden NFL 13, Assassin's Creed III and several other major games that also were released for PS3, Xbox 360 and, in some cases, PC. It's been reasonable to think that such support for Wii U will continue, but in the next six months, it seems that it won't. One hopes that Nintendo and the world's major game-makers at EA, Ubisoft, Take Two and elsewhere will have a few more chats, maybe fund some ports. Otherwise, if you only own a Wii U, you'll be missing out on some very promising games.